Jane always has some wacky questions that her forgetful grandpa can’t answer. So with the help of his friend Cat Blanket (a blanket that takes the cat's form! ), she travels to fun and interesting places in search of an answer. 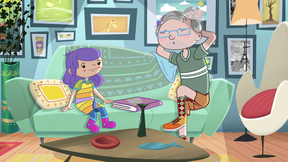 Juani loves listening to his grandpa’s travel stories but his memory isn’t really trustworthy so he can’t always solve his granddaughter’s doubts. 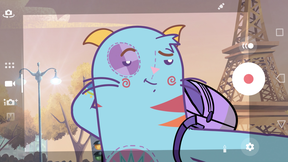 So she enlists Gatón, a blanket that takes the form of a cat, to help her follow her grandpa’s clues and go on fun adventures searching for answers. 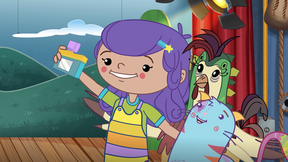 With imagination and teamwork, she’ll discover investigating and learning is so much fun! The trip starts aboard the Magic Ship and with some clues about the answer. So Juani and Gatón test their wits and start discarding the possible solutions that they find. However, Juani’s adventurous spirit and Gatón’s suspicions always get them into trouble. This is why this pair of friends must support each other and work together to get home safely and with the answer!